Porcelain veneers make it possible to correct irregularly shaped teeth, unsightly gaps, and deep discolorations quickly and painlessly. In short order, you can achieve teeth that look like they’ve had years of straightening. Veneers are thin, durable restorations of the most innovative dental ceramic available. They’re adhered to natural teeth in a way that makes the teeth become straight and uniform, producing an attractive smile. 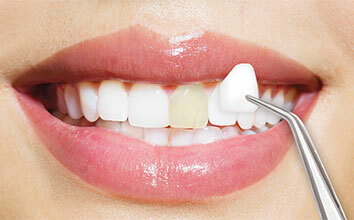 Veneers can also be used to correct the common dental problems of chipped, cracked, or worn teeth. Because a veneer is created to match the color of the surrounding teeth, it appears completely natural. The great thing about veneers is that they can address a lot of different problems. Maybe a couple of your teeth are on the short side. Or one has staining thanks to a childhood accident. Some people have teeth that appear battle-worn, with chips and cracks and other damage. Veneers make all of that seem to just go away! We can apply one veneer to one difficult tooth, or a full set of veneers to make your entire smile like new. Veneers can also be placed using a method that will give you a straighter smile without having to go through the longer process of orthodontic straightening. After determining the goal to be achieved and how you want your results to look, we remove a very thin layer of enamel and take an impression. Once the veneer or veneers come back from the lab, that’s when artistry takes over. We’ll prepare your tooth, shape the veneer, and adjust the shade to blend as perfectly as possible with your other teeth. A special light is used to quickly bond the veneer, and viola! You have a great new smile! Schedule a complimentary consultation by calling (423) 586-3432, and we’ll discuss the ways porcelain veneers can improve your smile!